When I asked Wendy Scherer to take over Flashfree for a day, I didn’t know what she was going to write about. But I love this post. Because it demonstrates that escape from everyday stresses doesn’t always have to come from without, but rather, sometimes, the greatest joys and introspection can be derived even from mini-staycations. Baking as a staycation. Who knew?! Please show my friend, colleague and family member Wendy Scherer, some FF luv. I am not a cook. Ask anyone. I don’t like to cook. And frankly, I’m just not that good at it. I don’t have the patience to cut things into similar sized pieces, nor do I care. I don’t like picking out just the right recipe, reading Cooks Illustrated, or having to time out components to a meal. I’m quite fortunate that I have a husband who not only loves to cook, but makes terrific food. And considering that I do like to eat well, it’s a pretty cushy deal for me. When Andrew is out for the night and I’m in charge, I admit I can cook a few things. Quiche, lasagna, chicken pot pie, spaghetti, scrambled eggs, hot dogs. That’s just the beginning of my vast repertoire, but think you get the picture. Cooking stresses me out. The opposite is true of baking. I lose myself in it. Kneading bread is one of my greatest joys. I know what it should feel like and it’s exciting when it’s just so. Getting the crust to the exact right place before rolling it out. Now, there’s joy. Baking is precise in its proportions. I like that. It’s order. But it’s not science to make it wonderful; that is spirit, gut, instinct. I’ve always baked to relax. To de-stress. It’s like therapy to me, only much, much cheaper. I mean seriously, what costs less than yeast and flour? And I don’t need an appointment, either. The kitchen is open 24/7. And the best part is that I don’t have to eat the goods. There is nothing easier than getting rid of a rustic French loaf, an apple pie, and extra challah, or baguettes. Trust me, it’s true. I’ve always been this way. See me here at age 11. 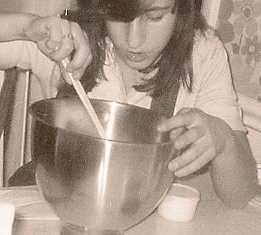 That’s when I decided that the first thing I want when I grow up is a Kitchen Aid mixer. And when I lived alone, single in my twenties, there’d be nights when I made a half dozen pies only to drive around the next day delivering them to grandparents and friends. And now, in the kitchen in my new home, baking has never been better. I have counter space galore and every rolling pin and baking mat has its place. But best of all, I have 3 teenagers to consume whatever I make. And they don’t even realize they’re doing me a favor. Wendy blogs at Finding Blanche http://findingblanche and photoblogs at http://wendyscherer.com and is on Twitter @wendyscherer. Nice post, Wendy! As someone who loves to cook, but is a terrible baker, I related to this in an upside down way. Because cooking makes me feel the same way baking does you. Thanks, Candace. We all find our joy somewhere! Secretly, I wish I liked cooking, too.